Sign up for the Kurochka newsletter! A symbol of Russian nature and Russian beauty, the birch tree (“bereza” or “berezka” in Russian) has a very special place in the country’s culture. It is a poetic symbol of the feminine, a lyrical image of spring, light and virginal purity. The slender birch brings to mind the image of a humble girl, beautiful,and very Russian. The word “bereza” is very ancient and is connected with the verb “to keep, to take care” (berech), since the Slavs considered the birch as a gift from God, given to them for protection. The birch had to be planted near the house and people tried to surround the village by a protective belt of birches, as they believed that the “birch spirit” can guard against all bad things. A birch was planted near the gate and people could speak with the tree and ask it to give them strength. The birch and things made from it, including birch bark, are considered talismans against evil forces. So anyone that’s dealing with a lot of stress (which is all of you, right?) is going to have to find themselves some birch trees. Or you can wear Kurochka Clothing’s Birch Tree shirt for instant protection and stress relief. In the Slavic folk calendar, the birch was assigned a most honorable place; the year began on March 1, the first month of spring, when the birch began to produce sap. It bore the name “Berezen” (bereza). Now the Ukrainian name for March is Beresen. In ancient history, the birch could well claim to be the emblem of education. In an era when paper was not yet known, simple Russian people who did not have the opportunity to acquire expensive parchment used birch bark for writing. Archaeological finds suggest a massive use of birchbark manuscripts in Russia. 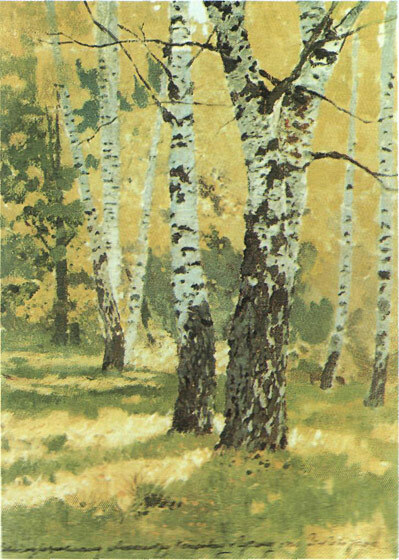 Tributes to the birch are found in Russian art, songs, poems and folk tales. Sergei Yesenin’s very famous poem “Bereza” was written in 1913. Click to read the text in Russian. A girl, the singer, seems to have been married to an old and unloved man; she is going to go into the woods, cut twigs from a birch tree and make musical instruments; she will awaken her old husband and offer him a variety of commands in a somewhat insulting way, so that he could clean himself and dress. The second part – she is going to go into the woods, cut twigs from a birch tree and make musical instruments; she will play these instruments to awaken her dear, offers him a variety of commands in a very loving way, so that he could clean himself and dress so they could go to the feast. “Berezka” is the name of a very famous Russian ensemble. Every concert put up by the Berezka starts with a folk dance called the Khorovod, in which they perform a sliding step. What’s so special about this step is that they hardly appear to move at all. They really seem to be standing still while the stage beneath them moves. Even the skirts worn by the dancers don’t seem to move. One of Faberge’s Easter eggs made of Karelian birch were produced in 1917. It is called «Берёзовое» (meaning, “Made from Birch”).